Somewhere along the way, I decided I shouldn't use people's real names on my blog. To protect their privacy or maybe to keep my fans guessing. I'm not sure. Instead of making up names, I usually use the first letter of their name, followed by -ster. I don't know where it started, but it's what I do. But, now I have a dilemma. 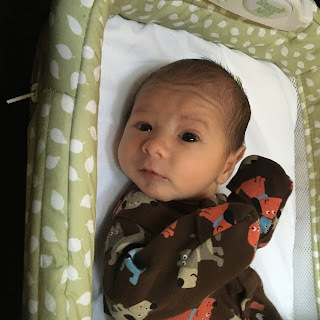 Because this little guy entered the world at the end of December. And his name begins with L.
But I already have an L-ster, so this could lead to very confusing posts because that L-ster is a girl. So, since Strauss could fit with his name, and I will leave the reasons why to your imagination, he will henceforth be known as Mr. Strauss. Most people don't get titles here on Aunt Mildred's porch, so that's a pretty big deal. Oh and Mr. Strauss will only apply on the blog. I don't suppose I'd ever get away with calling him that in real life. For those of you keeping score track, this is my youngest sister's baby. My sisters each have one, so now I have a niece and a nephew. And since he was born in December, a high sickness month, we all had sinus issues and were afraid to spend much time with him. I held him in the hospital like I was drinking vodka in a Russian freezer. Partly because it was cold that day and partly because I didn't want to share any extra germs. Or get any scary germs from the hospital itself. My niece L-ster lives halfway down the country, so I don't get to see her very often. Mr. Strauss lives much closer though it feels like it takes just as long to get there. Since they live nearby, I will get to see him more than I get to see L-ster. What an exciting end to 2015 and entry into 2016!